Although some as-yet unturned rock might reveal the exception that proves the rule, it is safe to say that nobody in Tiverton wants the town’s schools to fail. The three-to-one vote to borrow $15 million to fix school roofs and HVAC systems shows the level of the town’s commitment to its children. That doesn’t mean that our school budget should be a sky’s-the-limit affair. Indeed, the same impulse that can drive parents, administrators, and the teachers’ union to demand more and more money can also harm the educational mission. A school system should be built on a determination to help students succeed no matter what, and the attitude that it is constantly under threat of being unable to reward its adult employees indicates different priorities. Think of it this way: When the PTOs send out notices that the Budget Committee will be considering the school budget, parents and teachers fill the town hall. 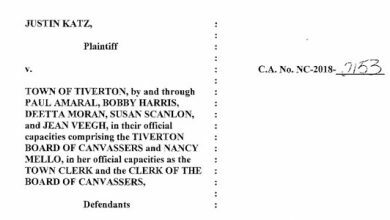 How many of them show up at School Committee meetings when important curricular questions are on the table? How many parents step forward during contract-negotiations to express concern that large increases for employees could eat up funds for innovative technology or even for fixing roofs and HVAC systems? The taxpayers of Tiverton should absolutely provide the resources necessary to ensure our children and our neighbors’ children have every opportunity to succeed. But acknowledging that principle still leaves us having to answer an important question: How much is really necessary? 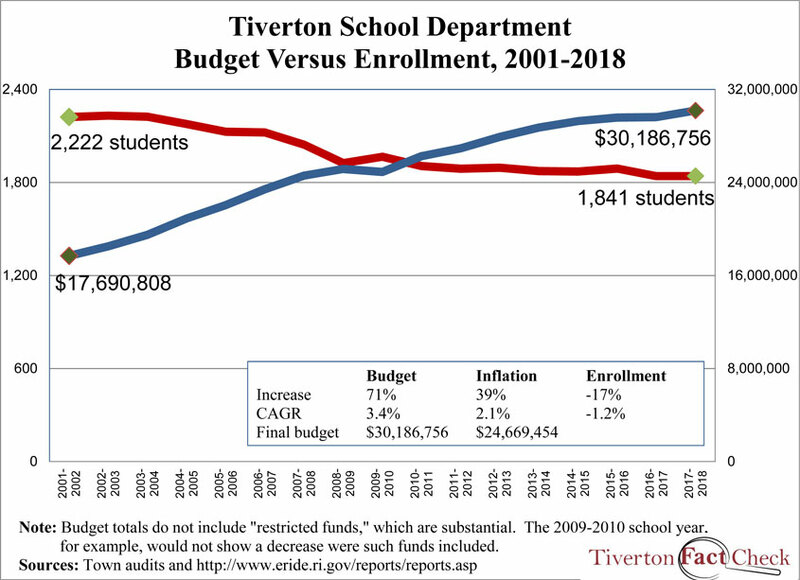 The following chart shows the trends in student enrollment in Tiverton public schools and the school department’s budget since the 2001-2002 school year. The enrollment numbers come from the RI Department of Education’s October enrollment reports and assume no change in the upcoming year; the budget numbers come from town audits and assume the school department gets its full request for next year. 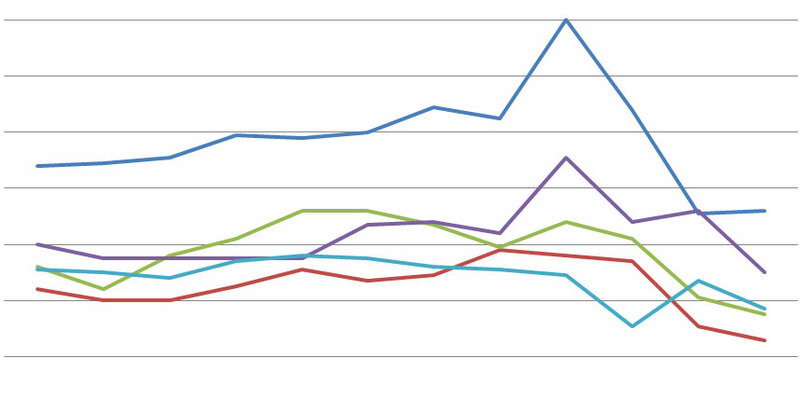 Enrollment has dropped by 381 students (17%). For some perspective, the average full grade was around 171 students in 2002. In other words, the district has lost the equivalent of more than two full grade levels — all of fifth grade and all of sixth grade, for example. 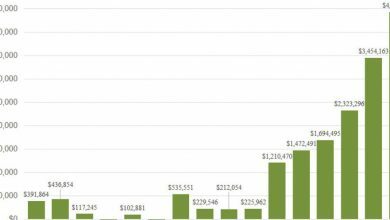 Meanwhile, the school budget has grown from $17,690,808 to $30,186,756 (71%). 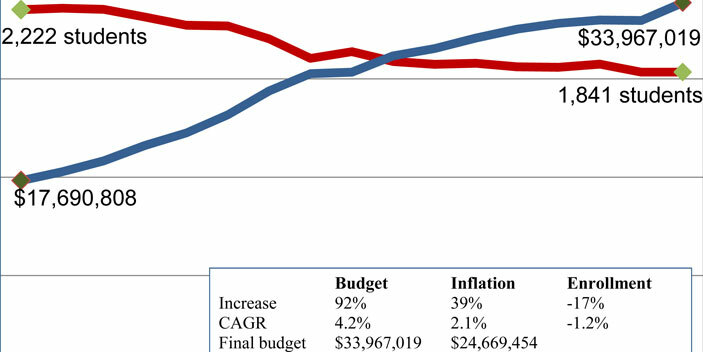 If the budget had only gone up by inflation over the same period, it would only be $24,669,454 (a 39% increase). 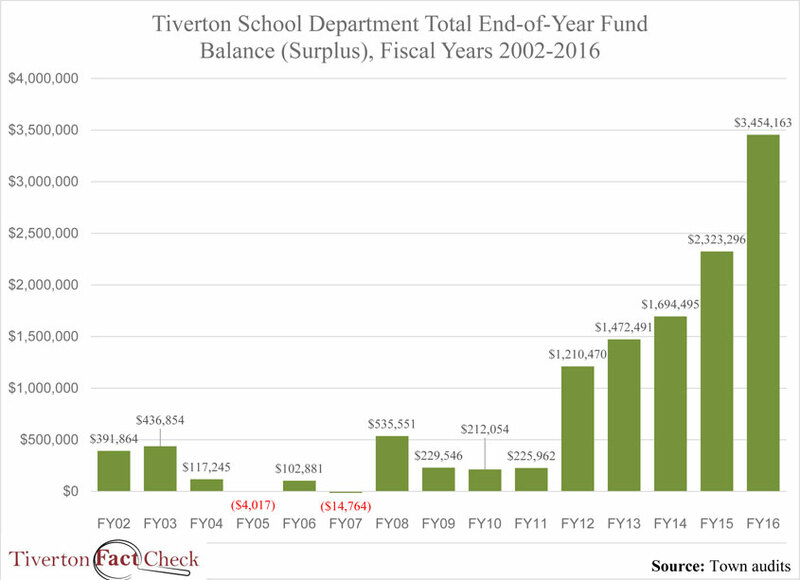 If we include the town’s annual payment on debt to build and repair school buildings — which is certainly part of Tiverton’s investment in its students, even if it’s not part of the school budget — the increase would have been 92%, or almost double. In recent years, this combination of lower enrollment and higher budgets has also come with an increasing surplus. Every year for the past six, the school department has added between $222,004 and $1,130,867 to its fund balance, to the point that it had an extra $3,454,163 according to last year’s audit. 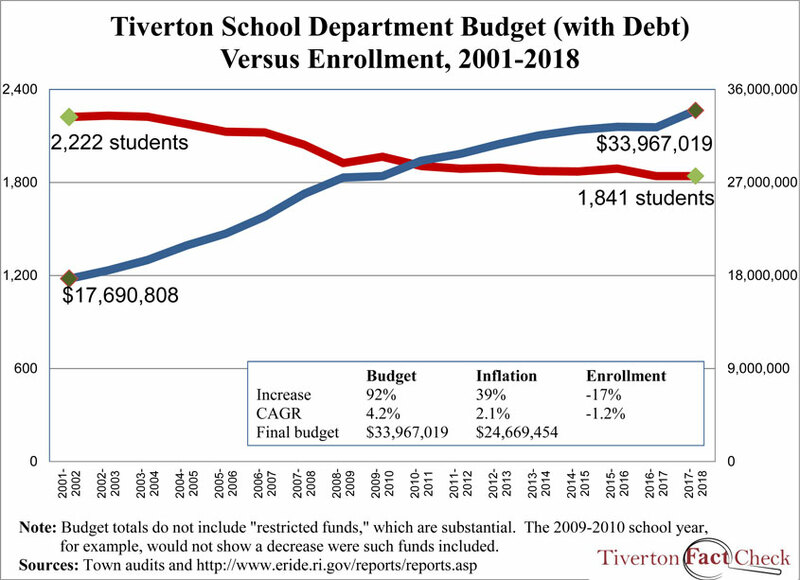 With its massive surplus, years of budgets well beyond inflation, and shrinking enrollment, the Tiverton School Department can surely hold its budget from local taxes level as the people of Tiverton absorb the hit of yet another school-related bond.